A 6 month closure of the 2nd/Broadway intersection will take place for utility relocation in preparation for 2nd/Broadway Station construction, starting Saturday, February 27, 2016 starting at 7 a.m.
Broadway between 1st St and 3rd St & 2nd St between Hill St and Spring St. Click here to view detour map. A series of weekend closures will follow to install piles & deck, these closures are necessary for tunnel construction to begin. Local access to businesses, residents and emergency responders will be maintained during the closures with a construction crew onsite granting local access. Monday – Friday from 7 a.m. to 11 p.m., Saturdays from 8 a.m. to 11 p.m., and Sundays from 7 a.m. to 9 p.m. Overnight work between 11 p.m. and 6 a.m. may be necessary. A separate notice will be issued as work gets scheduled. The following bus lines have been relocated as of February 19, 2016 through the duration of the closure. For real-time information and service alerts to plan your trip, visit metro.net or call 323.GO.METRO. 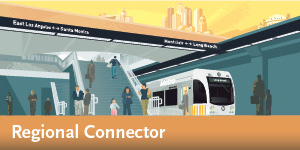 Please visit http://www.ladottransit.com/dash for D DASH route and bus stop relocation. Starting on Saturday, February 27, 2016 at 7 a.m., a full weekend closure of the 2nd/Broadway intersection will be in effect to install K-rail (concrete barriers) and reconfigure traffic lanes to implement the 7-month and subsequent 4-month closures. Local access to businesses, residences and emergency responders will be maintained in the closure area. Left on Hill St, right on 1st St, right on Spring St, and left on east bound 2nd St.